FILE - A policeman stands guard at an Election Commission office in Quetta, Pakistan, May 8, 2013. The Election Commission has twice rejected the registration of Milli Muslim League, citing its alleged terror ties. General elections are scheduled for July 25. As Pakistan prepares for general elections in a few weeks, the Milli Muslim League (MML), a banned militant group-turned-political party, says it will field hundreds of candidates across the country under the umbrella of Allah-O-Akbar Tehreek (AAT), an old Islamist political party. MML, established in August 2017, joined hands with AAT after Pakistan's Election Commission (ECP) rejected MML's request for registration last month. "Getting into politics is the right of every Pakistani, and no one can be denied their basic, fundamental right. That's why we have decided to participate under the umbrella of Allah-O-Akbar Tehreek in the upcoming elections," MML spokesman Ahmad Nadeem Awan told VOA. The ECP first rejected MML's request to be recognized as a political party last year, after Pakistan's interior ministry reached out to ECP and accused MML of serving as a front organization for Jamaat-ud-Dawa (JuD). 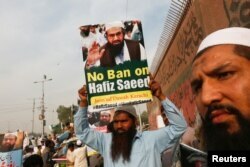 FILE - A supporter of Islamic charity organization Jamaat-ud-Dawa carries a sign with others as they listen the speech of leaders (unseen) condemning the house arrest of Hafiz Saeed, chief of JuD, during a demonstration in Karachi, Pakistan, Feb. 3, 2017. JuD is a banned militant group — the U.S. and U.N. have designated it terror organization — with ties to Hafiz Saeed, a U.S.-designated global terrorist accused of being the mastermind of the 2008 Mumbai terror attacks that killed 160 people, including six Americans. The U.S. State Department imposed sanctions on MML in April and labeled its leadership as terrorists. In March, the Islamabad High Court instructed the election commission to re-evaluate its decision about MML. The electoral body again rejected MML's registration request. Awan, the MML spokesman, criticized ECP's decision, saying it had denied the group a fundamental right. "Our right to register at Pakistan's electoral body was denied twice despite the ruling by the Islamabad court. But this will not stop us from participating in the elections," Awan said. Some experts in Pakistan view MML's alliance with AAT as "alarming" and say it will reinforce allegations that Pakistan is unable or unwilling to curb militant groups' activities. "Disappointing and very alarming — allowing MML to participate under some other political platform will only add to the global pressure and criticism on Pakistan regarding cracking down on militant groups," retired Lieutenant General Talat Masood, a prominent defense and security analyst, told VOA. "Don't forget, we have just been added to FATF's terror watch list, and there is a possibility of going on the blacklist in the coming months." Last week, the Financial Action Task Force, a global financial watchdog, placed Pakistan on its terror watch list for its alleged failure to address terror financing and money laundering in the country. Zahid Khan, a leader of the Awami National Party and a former senator, said MML's ability to run in the elections pointed to the failure of the state and election commission, especially when election officials were warned against allowing militant groups to run for election. FILE - Hafiz Saeed, head of Jamaat-ud-Dawa, gives a Friday sermon at a mosque in Lahore, Pakistan, Nov. 24, 2017. "The political parties in a meeting with ECP last month clearly expressed their concerns that militant-turned-political parties must not be allowed to contest the elections at any cost. It is against the constitution and the stance that the government has taken in the past few months on MML," Khan said. MML is reportedly aiming to field 260 candidates to participate in the state and provincial elections. Seventy-nine candidates will run for the national assembly. Another 181 candidates will seek seats in provincial assemblies. Saeed's son and son-in-law are among the MML's chosen candidates. Thirteen women also are running on MML's behalf. "We have chalked out our strategy on motivating the voters to come out and cast their votes for AAT. It's unfortunate that we have to run the elections under another political party, but what is important is we will be contesting the elections," Awan said.